God's Love Ministries > Praise Reports > God will make the stammering tongues to speak. God will make the stammering tongues to speak. My name is Wilson. I come from Pallikaranai. This is my grandson. While he was in the womb, during the sixth month my daughter had high pressure and so had to deliver the baby during her eighth month. When he was three and half years old he was not able to speak properly. I n the month of May, we attended the meeting ‘Aaruthalai Thaedi Oru Naal’. When we came for Individual prayer, we told brother about the child and asked him to pray. Brother Prophesied saying that the Lord has given him the tongue of the learned and told us that we would testify in the meeting next month. 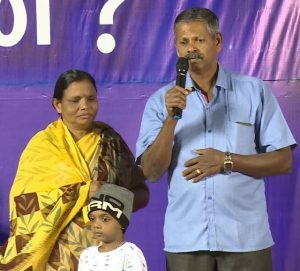 In the same way, the next day even before the meeting ‘Aaruthalai Thaedi Oru Naal, the child said, “Thatha have you returned from your duty?” Now he is four and a half years old. He is talking so well. While I get ready for work, he says, “Pray and go.” It is a great miracle that my grandson is talking. My daughter conceived with the second child. During the 7th month, they said that her pulse rate had gone down because of pressure. She faced a lot of problems because of the fluctuation in her pressure. We went to the Prayer tower and told brother what the doctors had said about my daughter. Brother prayed and said “God has fixed a new heart from heaven”. In the same way within 3 days, the heart rate increased and she delivered the baby safely. Today the baby is one year and one month. As she had pressure we kept her in our house for more than a year. Last year during the sixth month there was a four day meeting at Madambakkam. All of us except my son-in-law had attended that meeting. Brother said “Some parents are worried and are crying because your children who came for delivery have not returned to their husband’s home. Today God is hearing your prayers and meeting your needs.” That day, my son in law had asked my daughter to take him for the meeting. So for the last two days meeting all of us went for the meeting. As a result brother touched my children and prayed for them. Today they are living a happy married life. I thank brother and his family for their prayers. Dearly beloved brothers and sisters in Christ, God is faithful to bless and deliver you too from all your problems. Have faith and cling onto the promises of God.